The reading was the highest since May 2013. While weather was the most important factor affecting crops, Russia's annexation of Crimea introduced fear into grain markets and the wheat market in particular, and risked damaging trade patterns, a FAO senior economist told Reuters. "Political tensions of the sort we see today have the risk of taking us back to a Cold War situation, where countries make purchases of grain not only based on price differences offered but also because of political alliances," Abdolreza Abbassian said. In March, FAO's cereal price index rose significantly for the second month in a row, jumping 5.2 percent to its highest value since August 2013 due to unfavorable weather in the south-central United States and Brazil, along with uncertainty over grain shipments from Ukraine. The sugar price index saw the greatest percentage increase, rising 7.9 percent on the previous month due to drought in Brazil and reduced sugarcane output in Thailand. Dairy was the only index to ease, the first fall in prices since November 2013, affected by reduced purchases by China and strong supplies in New Zealand, FAO said. "Apart from dairy which probably had its peaks already and is now relaxing, prices, even if they don't rise further, will remain firm until we know a bit more about how the weather is going to influence the new crops," Abbassian said. 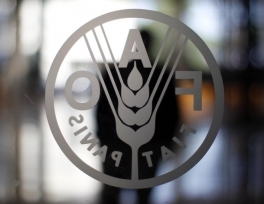 FAO raised its global cereals production forecasts to 2.521 billion tonnes in 2013, an increase of 6 million tonnes from its previous forecasts, reflecting higher estimates for coarse grains and rice. However, world wheat production was seen lower at 702 million tonnes in 2014, down 2 million tonnes from the previous forecast and 2 percent lower than last year's record harvest. FAO estimated world cereals stocks to be 582.3 million tonnes at the close of crop seasons ending in 2014, an increase of 3.8 million tonnes from its previous forecast.